This whole week, ookyo is giving you up to 8 free pusos for your Dooit game. 1. Simply enter your email address into the text box and get the code. 2. Enter the code in the Dooit app to redeem your free puso! You can claim up to 8 pusos before the ookyo game on Friday, 7 December 2018 where you can stand a chance to win a share of RM10,000! Want unlimited internet on your Dooit app? 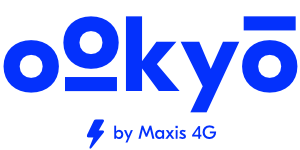 Sign up with ookyo now and get UNLIMITED HIGH SPEED INTERNET for any apps plus extra 8GB high speed data! An individual email address submitted on the ookyo website can claim the code once every day during the campaign period (30 November – 7 December 2018). The code can only be claimed on the Dooit app for 1 free puso. The Dooit app can be downloaded on the Google Play Store or the App Store. The code is not valid for new ookyo sign ups.